"Due to the pet food recall I decided to submit this recipe for other dog owners looking for a soft pet food alternative. This has been reviewed by my vet and approved. This is a great healthy recipe for dogs and can be cut in half for smaller dogs. Combined with a kibble this recipe lasts about 4-5 days for 2 large Golden retrievers. Be sure that your vegetable mix contains no garlic or onions!" Place chicken, vegetables, and rice into a large saucepan or Dutch oven. Stir in water until the mixture is smooth. Place over medium-high heat and bring to a boil, stirring constantly. Reduce heat to medium-low, cover, and simmer until the rice is tender and all of the liquid has been absorbed, about 25 minutes. Cool completely before serving; store covered in the refrigerator. 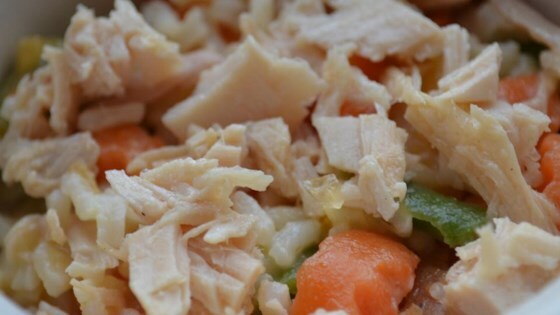 See how to make dog food from scratch using turkey, rice, and veggies.